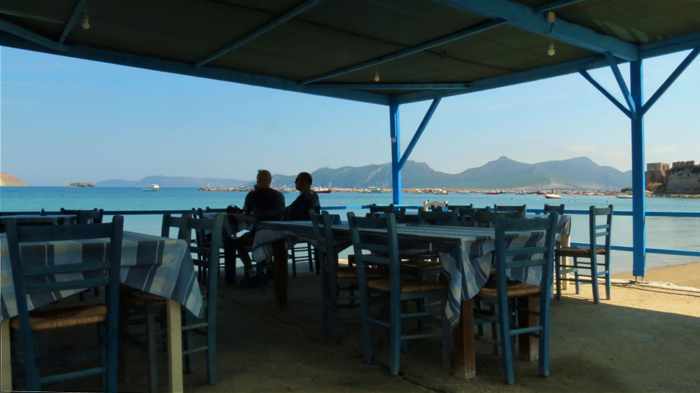 Seaside dining: It was a huge treat to have lunch in the town of Methoni after visiting the area’s leading historic attraction for a few hours (which I described in my recent post, A Walkabout in Messenia’s 800-year-old Methoni Castle). 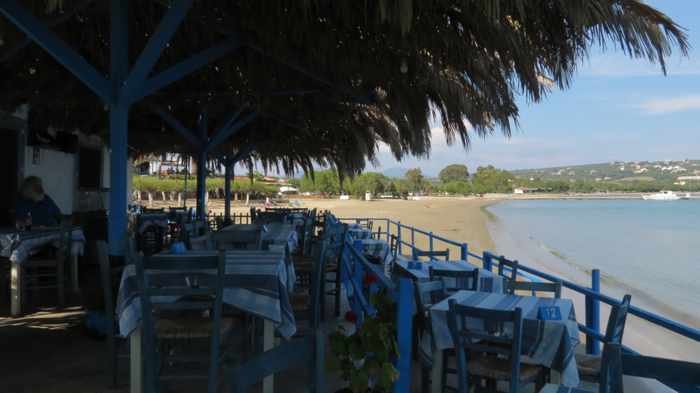 What made our lunch break so special wasn’t just our feast on fabulous Greek fare, but the beautiful views we got to enjoy from our seaside seats at Akrogiali Taverna. 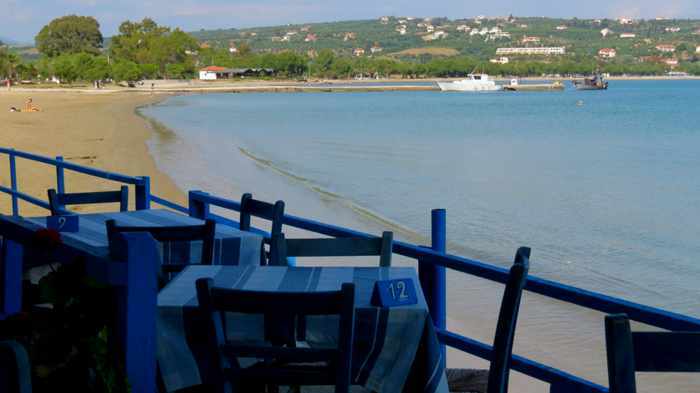 From our table a mere meter from the water’s edge, we could gaze at Methoni’s golden sand beach, its picturesque bay and small harbour, and the imposing stone walls of the ancient castle. That kind of restaurant location and scenic backdrop is simply impossible to find anywhere back home in Toronto. Even though our city boasts an enviably long waterfront on Lake Ontario and a clutch of small islands with extensive parkland just a short ferry ride from downtown, we can’t dine right beside the water anywhere (not even on the Toronto Islands), and there are no centuries-old historic places along the shoreline. (Toronto is a young city by European standards — it was incorporated only in 1834). 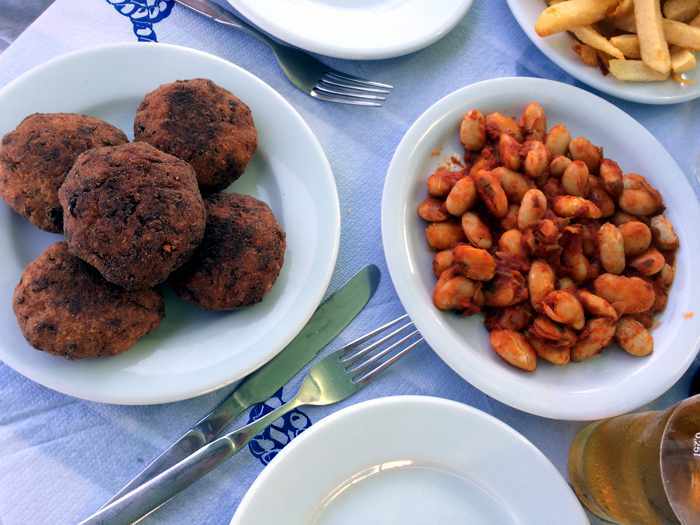 The unique experience of open-air dining at a beach or seaside taverna with a scenic view is one of the main reasons why we love travelling to Greece so much, and our visit to Akrogiali was the first such meal of our 2017 spring holiday. It really hit the spot given that it had been over 11 months since we had last been to a beach taverna. After walking around Methoni Castle in the hot sun for more than two hours, and then strolling through part of the town of Methoni, we were looking forward to cooling off in the shade and having a good lunch. 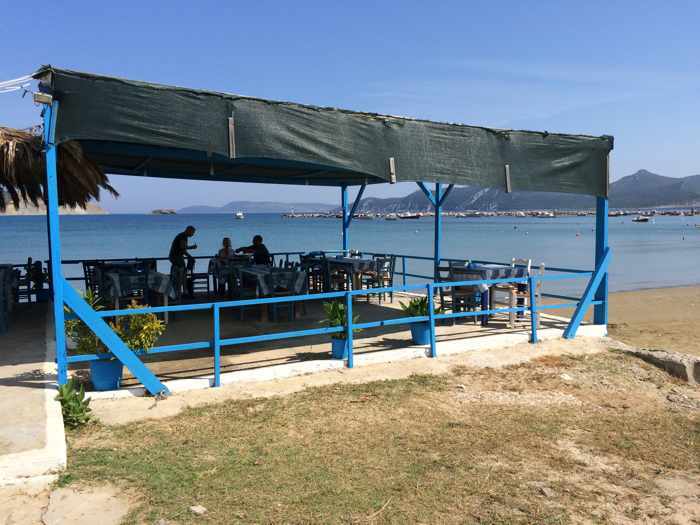 We found a couple of options on the Methoni beachfront, but liked the look of Akrogiali the best, so we got a table there. Our lunch was just as delicious as the scenery: Greek salad, gigantes (giant beans baked in a tomato sauce), kolykythokeftedes (zucchini fritters), piperies me tyri (grilled peppers stuffed with a spicy feta), keftedes (Greek meatballs), a platter of gavros (small grilled fishes) and a big plate of fried potatoes. With the calming views, light sea breeze and the sound of waves lapping against the sandy beach, it was pure bliss. I would have been happy to spend the rest of the day there, drinking wine and nibbling mezes while watching swimmers and boats in the bay, and looking at the castle. Below are more photos of our lunchtime view and three of the dishes we enjoyed. 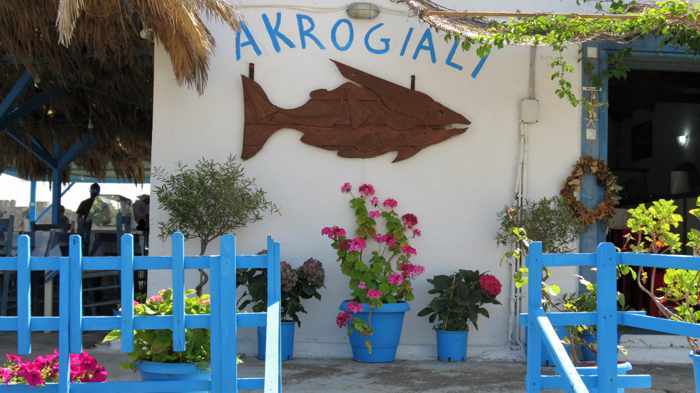 If you would like to read what other people have thought of the restaurant, you can find more than 100 reviews under the Akrogiali Taverna listing on TripAdvisor. 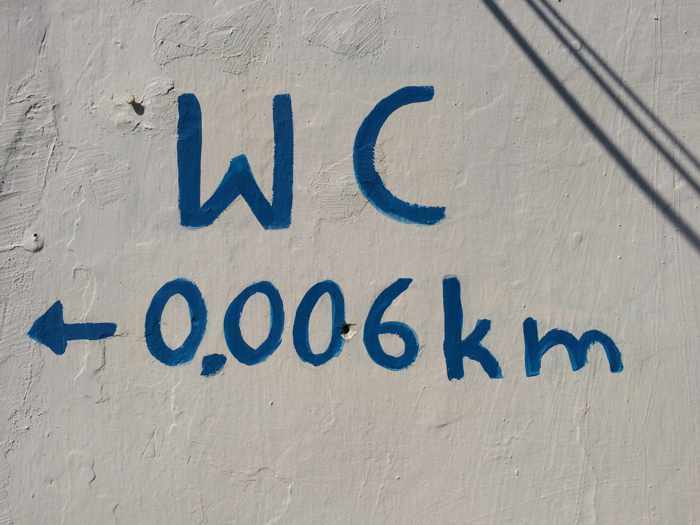 Toilet humour: a sign on the taverna wall points the way to the restrooms. 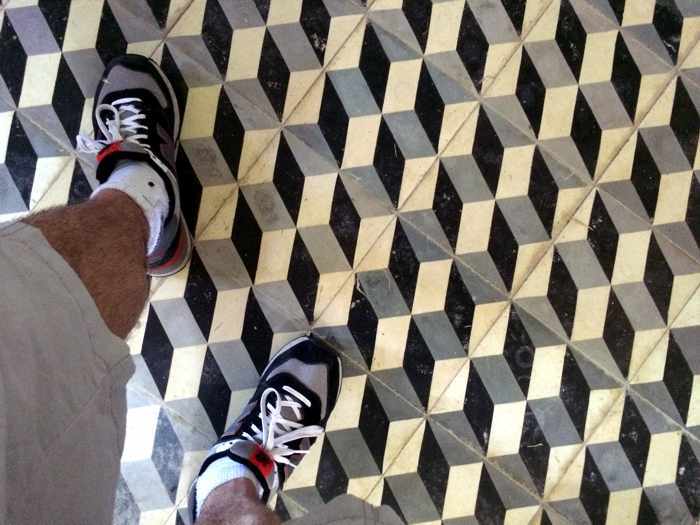 They were only 30 steps from our table. Methoni meanderings: Day 2 of our western Peloponnese road trip turned out to be rather “monumental” for us, figuratively speaking, as our travels took us to churches, archaeological sites and castles — some more than 800 years old — plus a place where two major Greek maritime conflicts occurred. 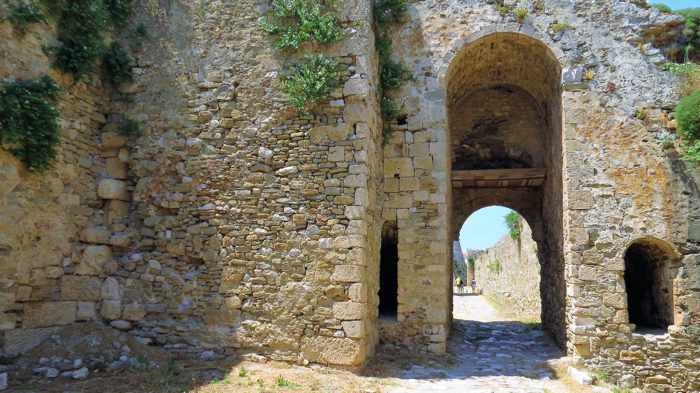 Our drive to and through hundreds of years of history took us first to the Byzantine Church of Samarina, which dates from the 12th Century, followed by a walk around the ruins of the Castle of Androusa, which was built in the 13th Century. Next stop was the town of Pylos on Navarino Bay, where two of the most significant naval combats in Greek history took place: the Battle of Pylos which was fought in July of 425 B.C. during the Peloponnesian War, and the October 20 1827 Battle of Navarino, the most pivotal and decisive event of the Greek War of Independence from Turkey. 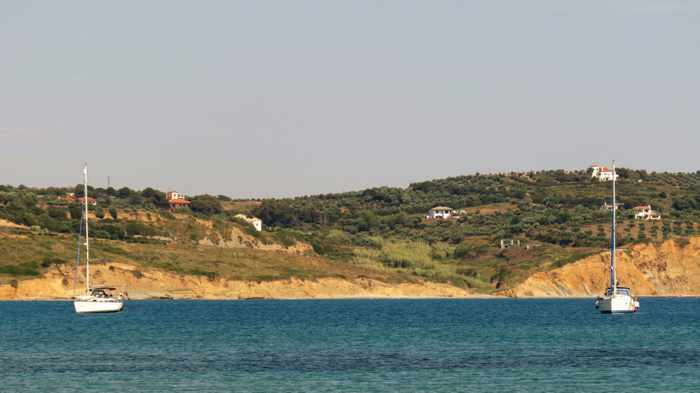 Besides observing the bay from a variety of vantage points in and around Pylos, we managed to see some of the exterior fortification walls of the impressive Neocastro (Castle of Pylos), which was built in 1573. Unfortunately, we didn’t have time to go inside to tour the castle interior and see its remarkable hexagonal citadel. 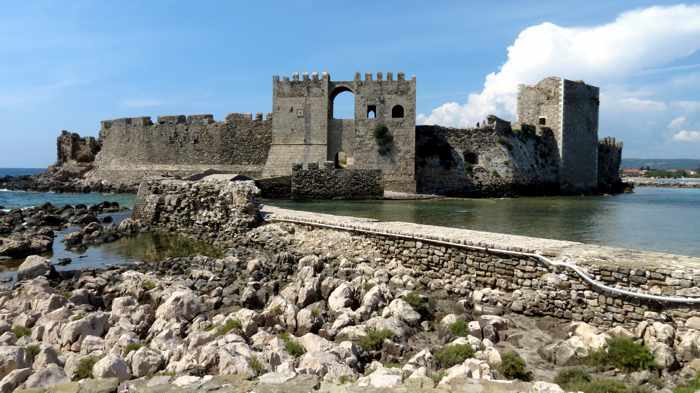 Our final sightseeing stop was the town of Methoni, where we paid an afternoon visit to the majestic Methoni Castle. 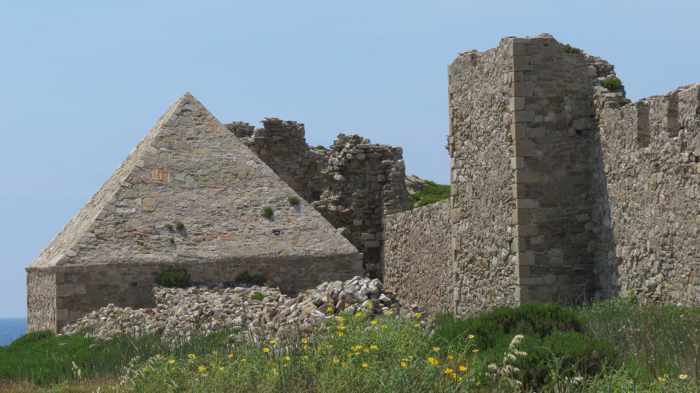 This pyramid-roofed building was apparently used to store munitions. The inner castle wall beside it is crumbling in places, but visitors can still walk on the top to get views of the entire castle site. 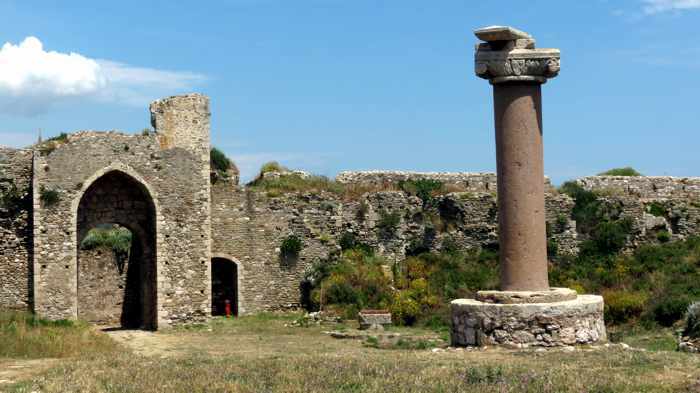 A curiosity inside the castle is a tall, red granite column topped with a Byzantine-style capital. Often called “Morosoni’s Stele,” the column is believed to have been topped with either a sculpture of the winged lion of Venice, or a bust of the Venetian Doge Francesco Morosini. 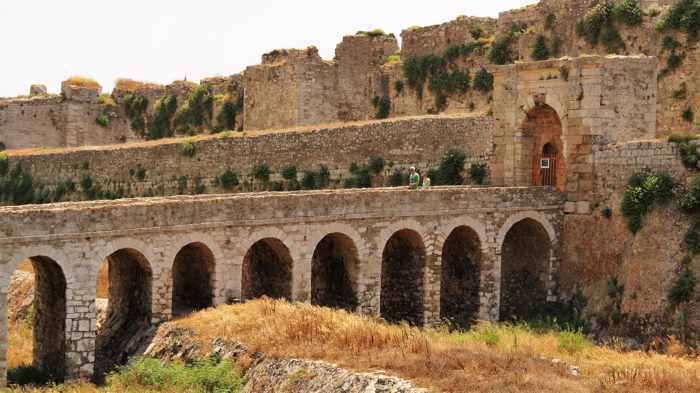 My favourite castle features were the elegant stone entrance bridge (built by the French in 1829 to replace a wooden drawbridge), the Bourtzi fortress, the interior of Metamorphosis church, and the breathtaking 360-degree views from atop one of the main inner walls. I also was fascinated by the variety of shapes and angles that architects had chosen when designing the castle’s imposing fortification walls and the buildings they protected. 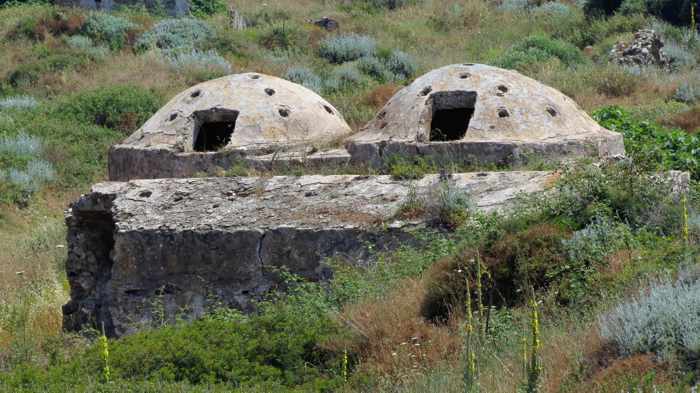 These included rounded and pointed archways, square and rectangular houses and public buildings, an arsenal with a pyramid-shaped roof, the octagonal Bourtzi fortress, sloped and vertical defensive walls, and the round, spaceship-like domed roofs of the hamam (Turkish baths) built by Ottoman occupiers. Admission cost only €2 per person, by the way — a bargain, considering the size of the castle. Below is a brand-new aerial video of Methoni Castle that was published, coincidentally enough, right while I was putting this post together. On page 2 you can view some of the photos we shot while meandering through the ruins. 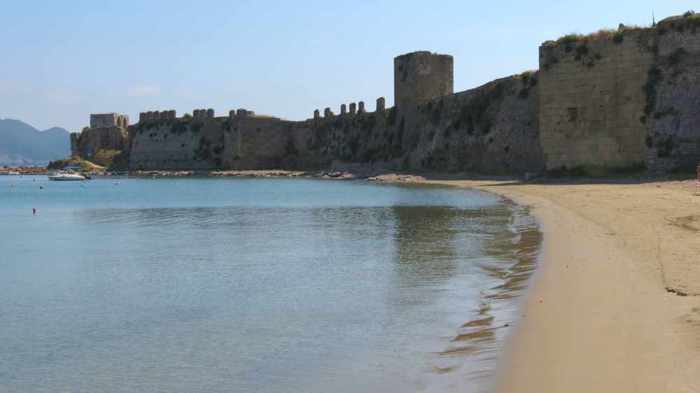 If you’d like to read more about the history of Methoni Castle, click here to read a detailed description from the Kastrologos Castles of Greece website. 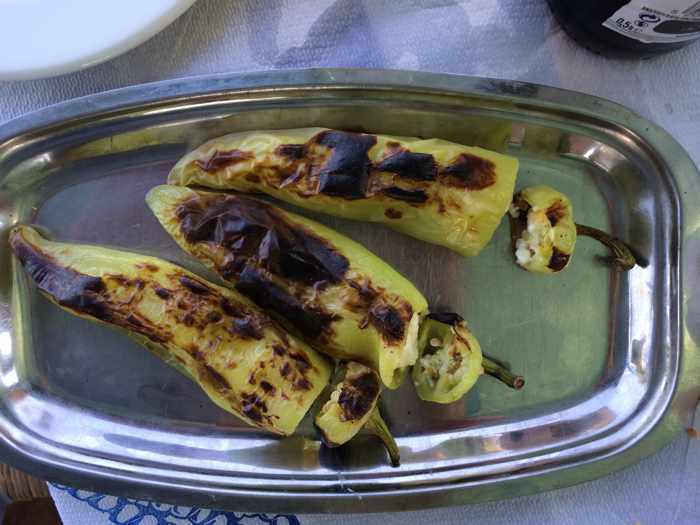 All-new experiences: Two trips to Greece in 2017 gave us opportunities to expand our horizons and see diverse regions we had never visited before, including parts of the Peloponnese, one of the Ionian islands, Central Greece and southwestern Crete. Our first vacation, from May 22 to June 7, gave us impressive introductions to the western Peloponnese, Kefalonia, and Central Greece. 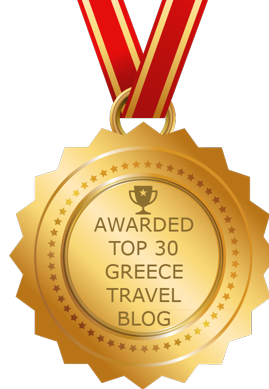 The second holiday, from October 19 to November 6, took us along the spectacular southwestern coast of Crete. With the exception of our arrival and departure days in Athens, plus a 4-night stay in Chania (which we had seen briefly during our first trip to Crete in 2004), every place and region on our itinerary was completely new to us, offering a tremendous variety of first-time experiences for accommodations, activities, dining and sightseeing. Our travels took us to several spots we would absolutely love to revisit, along with many more we would be happy to see a second time if we find ourselves in the area once again. As for the few places that didn’t quite catch our fancy, our mixed feelings were simply due to the time of season we happened to be there — now we know when to return to enjoy them better. Happily, there wasn’t a single destination we disliked. Our spring vacation began with a 4.5-day road trip, with friends, through the Messenia and Elis regions of the southwest and northwest Peloponnese. We covered considerable ground in that time, moving at a much faster pace than we usually travel, but the goal was to give us a peek at a number of different places so we could find favourites to revisit for longer periods in future. After the Peloponnese segment of our holiday, a week-long visit to Kefalonia island and six days in Central Greece gave us time to relax and to comfortably explore towns and sites on foot rather than by car. On page 2 of this article, I have posted photos and brief descriptions of the main locations and key attractions we got to see during our car tour in the Peloponnese. Pictures of the places we explored on Kefalonia and in Central Greece, and those we visited during our fall holiday on Crete, will appear in separate posts. Future articles will spotlight specific destinations in greater detail, and will profile hotels we stayed at and restaurants where we dined. Please click on the link under the next photo to continue reading on page 2. Captivating coastlines: Two back-to-back trips have made us big fans of the Peloponnese, and its extensive, awe-inspiring coastlines in particular. 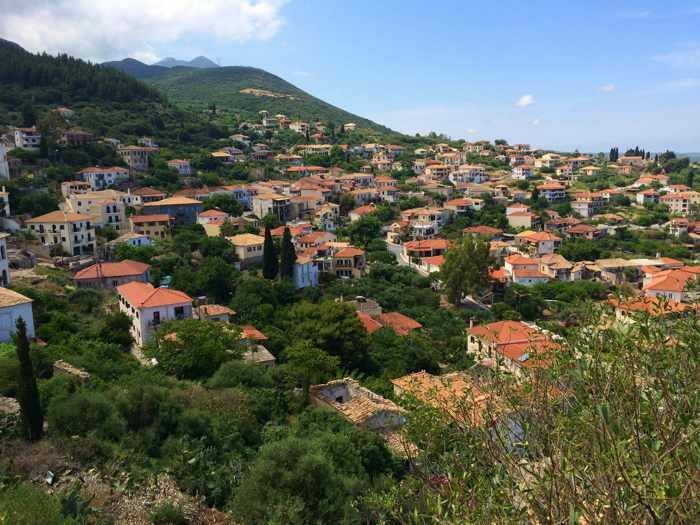 In 2016 we spent most of our time in the eastern Peloponnese, staying in the scenic seaside towns of Nafplio, Monemvasia, and Tolo, and driving along the beautiful coast in the Laconia region between Nafplio and Leonidio. 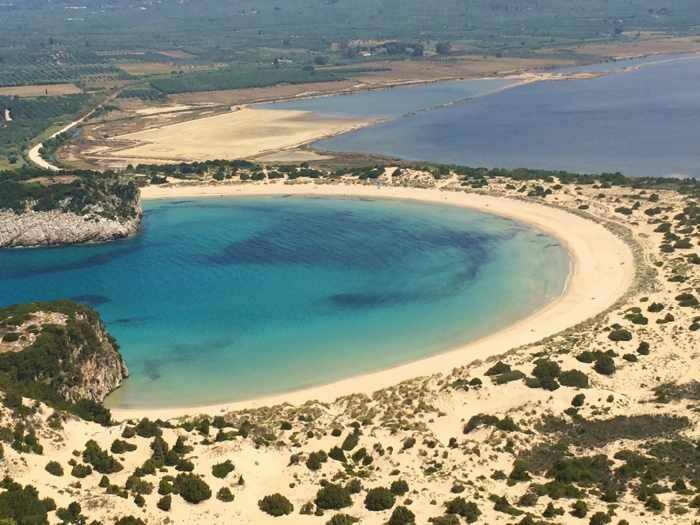 Much of this year’s trip took us to umpteen beautiful spots on the western Peloponnese seashore, including Pylos, Methoni, Voidokilia beach, Marathopoli, Kyparissia, Katakolo, Kyillini, Patras and many places in between. It was an incredible visual feast of destinations, but it left us hungry for more. 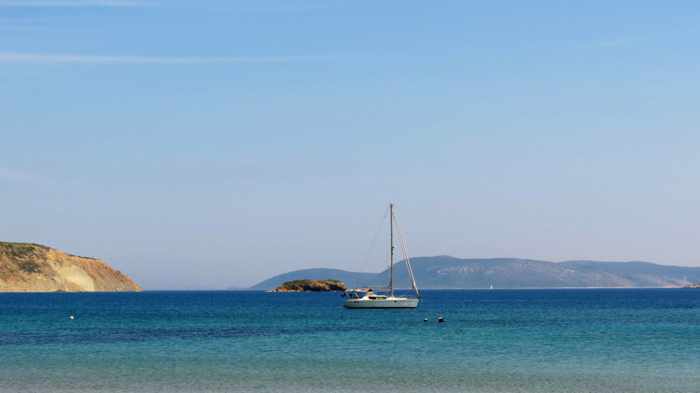 Luckily, there are many miles of spellbinding seasides we haven’t yet explored, including the southern Peloponnese coastline from the Mani peninsula all the way east to Elafonnisi island. By chance, I found the film, Reflecting on the Peloponnese, shortly after returning home from our latest sojourn in Greece. With its captivating aerial views of such now-familiar places as Monemvasia, Methoni and Voidokilia, it instantly brought back vivid memories of our two most recent vacations. 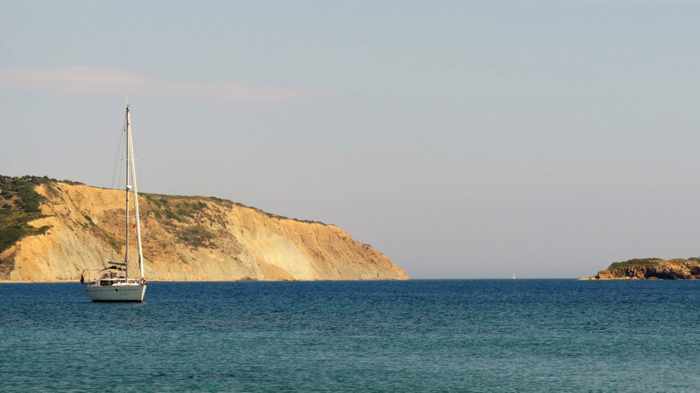 At the same time, it stirred our desire for another trip to the Peloponnese, so we can try to see the other fascinating sites shown in the video, including Kardamyli, Limeni, the Dimitrios shipwreck near Gytheio, Elafonissi, and more. The film runs less than 3 minutes, but you’ll find it’s a wonderful aerial journey across an amazing part of the Peloponnese.